Hi friends! I'm starting a new series on this blog called "This Week's Favorite Pins". In this series, which will be posted every Sunday, I'll highlight some of my favorite educational pins of the week. Since this is Life in First Grade, most of the pins will be something that pertains to lower grades. If you want to see upper grade pins, I'll be posting my weekly favs over on Life in Fifth Grade. :) You can find all my weekly favorite pins on this board. Each week, I'll add the pins to this board so you'll be able to go back and check out EVERY neat idea. You can find the source of each pin by clicking on the link below the picture. Let's jump into the first edition of this new fun series! 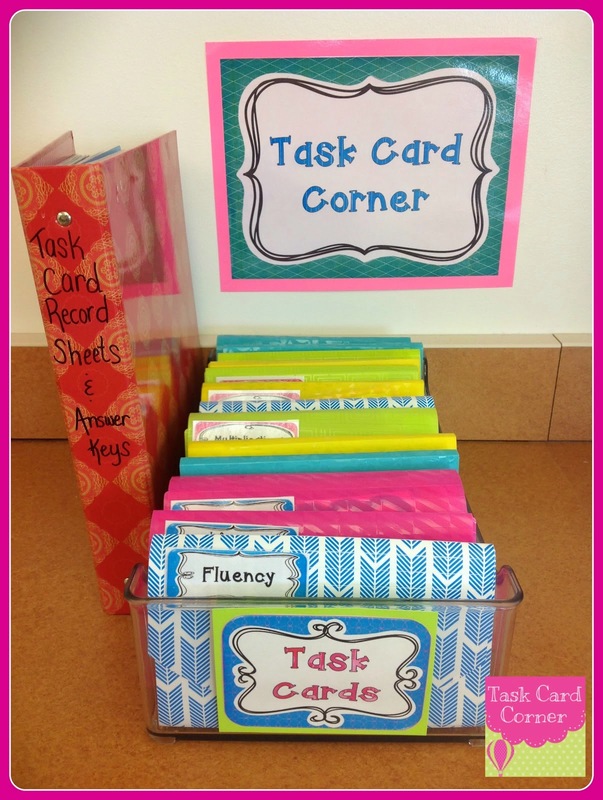 I've discovered how wonderful task cards are this year and I am in LOVE with this idea from Teaching with Task Cards. Target Dollar Spot always has these great mini coupon organizers and they are perfect for storing task cards! Isn't this next idea simply genius?? You could do this with so many different things. Love! The pin was dead, so if you are the owner of this idea and pic, let me know so I can give you credit! Do you see a pattern with these pins? I am obsessed with organizing ideas right now. I'm determined to make my classroom more organized next year so I can just pull out exactly what I need instead of searching everywhere. How great is this? 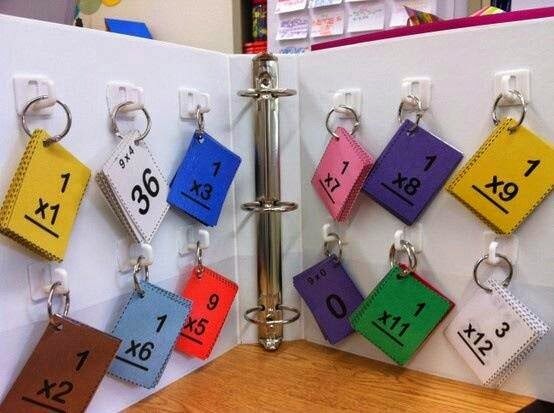 Perfect for separating specific colors and using them for math problems. Okay, after finding this next pin, I immediately wanted to run out and purchase command hooks and a curtain rod to make it. The idea came from the blog Fun with Firsties. Simply fabulous! 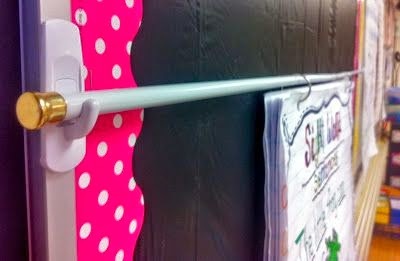 I am constantly looking for a way to display anchor charts without removing the paper from the entire chart and this would work perfect. Love! I love the hanging shoe organiser idea too and it has made such a difference to how organised I am with all my supplies this year - can grab things straight away rather than rummaging for ages! Will keep an eye out for more of your organisational pins! Thanks for sharing! This would be great as a linky, where other teachers could link up to their blog with their favorite pins from the week. 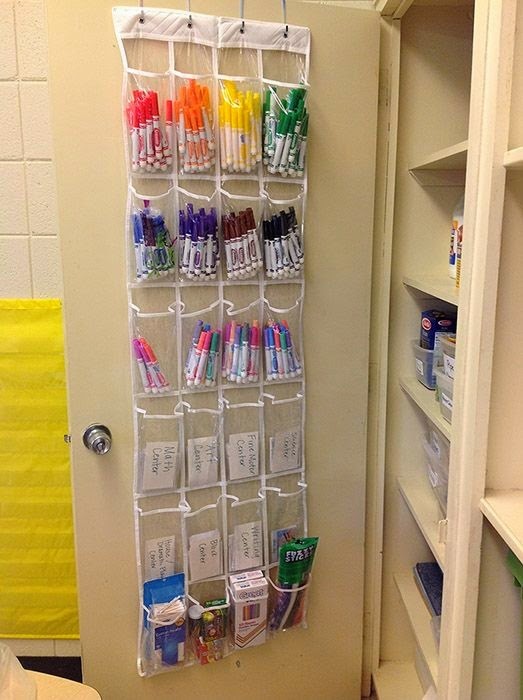 Great idea for the anchor charts!!! On my list for next year. Thanks for sharing!